Tricarico's paper "True polar wander of Ceres due to heterogeneous crustal density" appears in Nature Geoscience. Using data from NASA's Dawn mission, Tricarico determined the magnitude of the reorientation with three independent and corroborating lines of evidence. Global Gravity Inversion, from a paper Tricarico published in 2013, helped determine the density variations of Ceres, especially in the crust. This is what was used to find the equatorial density anomaly. Statistical analysis of topography was used for ridge analysis and the paleo-pole. And for matching the crustal fractures, a well-proven method by Matsuyama and Nimmo was used. 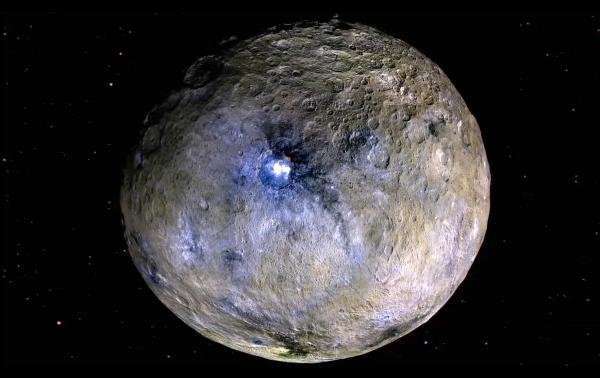 "The most surprising aspect of this paper is to me the observation that the pole of Ceres must have followed an indirect path to its current pole. A multi-step reorientation could mean that the equatorial density anomaly was still evolving during the reorientation, and this could be because the crust and mantle were weakly rotationally coupled, allowing the crust to start reorienting while the mantle would lag behind," Tricarico said. "If crust and mantle are allowed to shift with respect to one another, that could point to a layer of reduced friction between crust and mantle, and one of the possible mechanisms to reduce friction could be an ancient water ocean beneath the crust."